In 1919, at the Versailles peace conference after World War I, they Allied powers announced that they had no plans of returning lost territory to China as some had expected and handed over German possessions in Shandong province to the Japanese. Anti-foreigner resentment rose after the decision was announced. On May 4, 1919, about 3,000 students, scholars and dissident intellectuals from 13 colleges gathered in Tiananmen Square to protest the loss of Chinese territory in Shandong to Japan. The May 4th Movement started out as student protests against the decision at the Paris Peace Conference to award Japan control of German concessions in China's Shandong province. It soon encompassed a broader debate about how China should modernize. It spawned a host of writers famous throughout the Chinese world, including Lu Xun, who, like George Orwell, wrote biting social satire and sought to change what they viewed as a corrupt, backward and foreign-dominated China. In Touches of History, Chen Pingyuan offers refreshing thoughts on how to come to grips with the ambiguity of the May Fourth. Chen begins Touches of History recounts the manifold events of May Fourth 1919, showing the spontaneity and haphazardness of student leaders as the protests unfolded. Next, he contrasts these unscripted student protests with the edifying and uplifting newspaper reports in the following days that launched a "history of reminiscences." The argument that May Fourth was the "Chinese Enlightenment," is best represented with the well-known case of New Youth, a journal whose editors, authors, and content have become synonymous with the canonical image of May Fourth as a literary and cultural movement. Conventional accounts tell us that the success of New Youth came from the editors' earnest advocacy for an independent spirit among young people, a new writing style based on the vernacular, and a critical reappraisal of the Confucian patrilineal family structure. These three concepts---new youth, new writing, and new culture---were arguably the very foundation of the "Chinese Enlightenment." Chen, however, reveals that the reasons for the popularity of New Youth were more complex than what one finds in many of the established literary-historical narratives. In addition to its cultural agenda, New Youth attracted a large readership because of its cultural capital (i.e., its connections with Peking University) and its historical roots (i.e., the vernacular movement in the late Qing). Book: Touches of History: An Entry into 'May Fourth' China by Chen Pingyuan (Brill 2011)' The Gate of Heavenly Peace by Jonathan Spence is about intellectual unrest at the end of the 19th century and the May Forth Movement. The protests launched the May 4th Movement---a nationalist movement opposed to the authoritarian government. They adopted "Science and Democracy" as their slogan and staged patriotic and sometimes bloody protests through out the 1920s. The May Forth Movement was the first major Chinese opposition movement of the 20th century. Students carried signs marked with "Mr. Science" and "Mr. Democracy," slogans that would reappear at Tiananmen Square in 1989. The essayist and short story writer Lu Xun (1881-1936) is considered by many to be China's greatest 20th century writer and the founder of modern Chinese literature. . Lu was trained as doctor and gave up his medical career he said to devote himself to curing social ills with his writing. He loved Jules Verne, and translated his stories into Chinese beginning in 1903 as part of an effort to help China develop an appreciation of Western sciences. Lu eventually gave up writing and took up politics. He allied himself with the Communists around the time of his death in 1936. Lu Xun is regarded as the pioneer of modern leftist Chinese literature. He was born in Zhejiang province, which is considered a a breeding ground of many Chinese artists and intellectuals. Today there is a literary awards named after him: the Lu Xun Award for short stories. Lu was "noted for his acerbic tongue and critical nature." He wrote in a simple, straight-forward style that contrasting sharply with the complex, classical language that was fashionable at the time he wrote. He resolved to diagnose Chinese society and culture through literature. Like George Orwell, wrote biting social satire and sought to change what they viewed as a corrupt, backward and foreign-dominated China. Among Lu Xun's more memorable characters is Ah Q, an allegorical, starving man on the street meant to represent the conflicts raging in China at the time. Lu's novella, The Story of Ah Q (1921), was a brilliant and vicious satire on Chinese traditions. Set in 1911. at the of the beginning of the ill-fated Chinese republic, it was about a peasant who survives a number if disasters, viewing each one as a triumph. His dreams of revolution ends with his own execution. In Memory of Miss Liu Hezhen is about 22-year-old Liu Hezhen, a student activist campaigning for a boycott of Japanese goods . On March 18, 1926, she was a a member of a group of students in Beiping (Beijing) that staged a demonstration to protest the Japanese navy opening fire on Chinese troops in Tianjin. 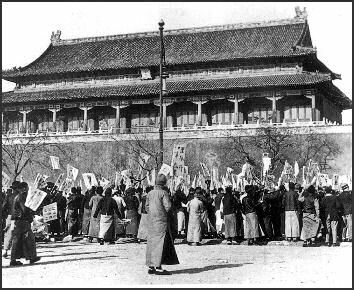 When protesters gathered outside the residence of Duan Qirui, a warlord who was chief executive of the Republic of China at the time, to submit their petition, a shooting was ordered and forty-seven people died.